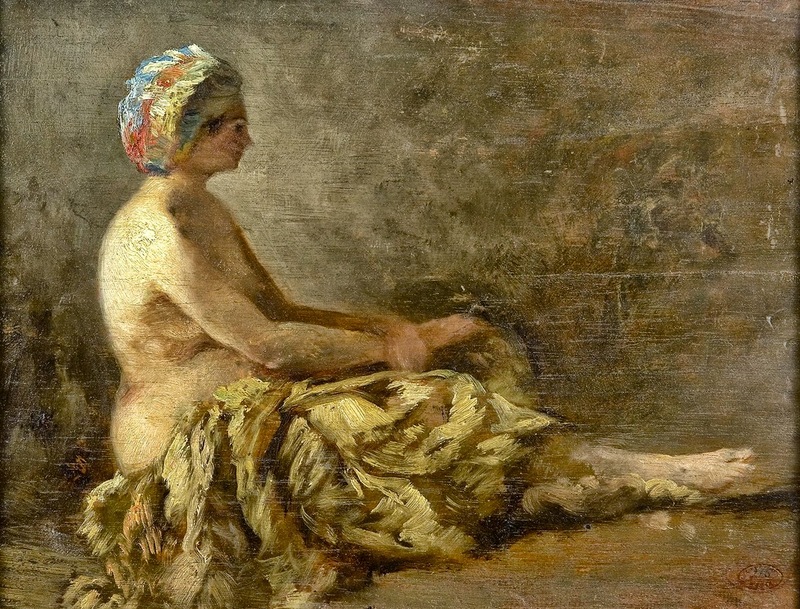 Félix Ziem (1821-1911) was a French painter🎨 in the style of the Barbizon School. 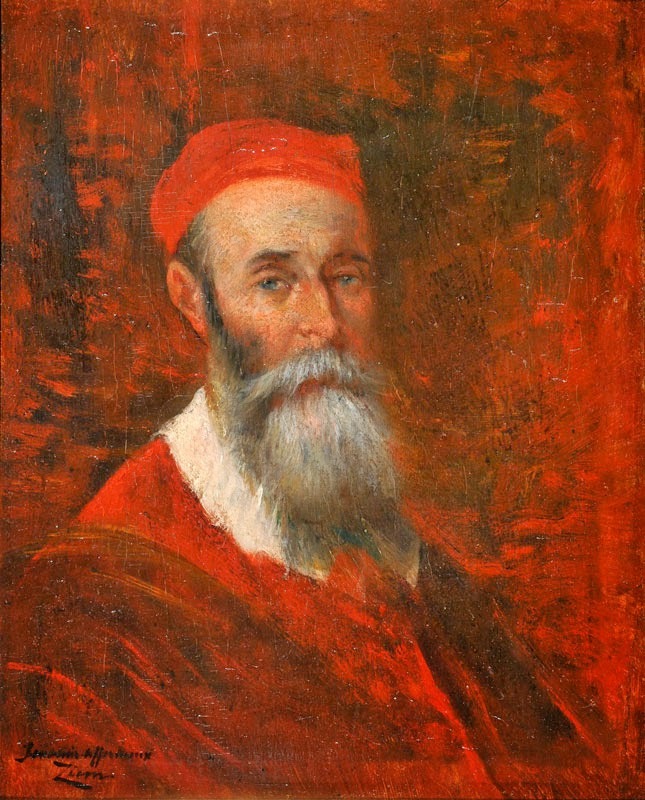 He was born Félix-Francois Georges Philibert Ziem in Beaune in the Côte-d'Or département of the Burgundy région of France. 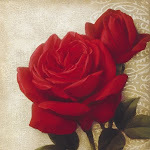 His mother was a native of Burgundy who married an immigrant. 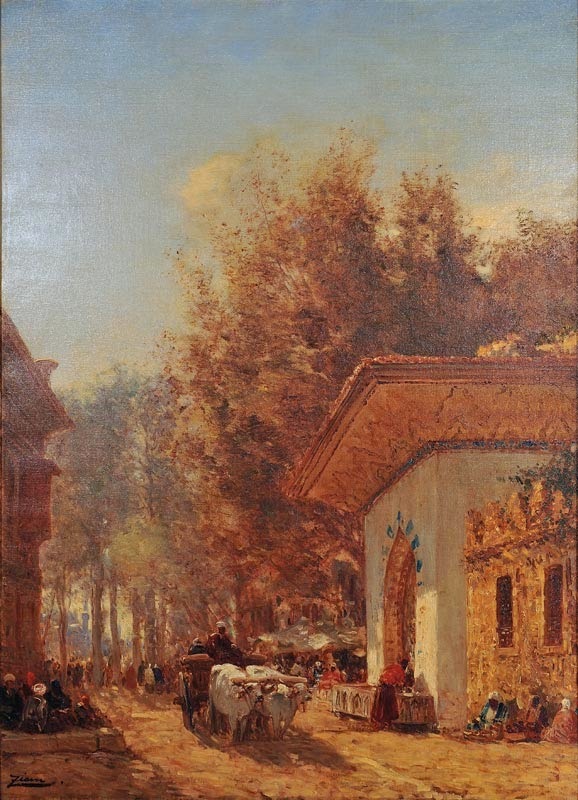 Originally, Ziem planned to be an architect and studied at the School of Architecture in Dijon, and for a time worked as an architect. 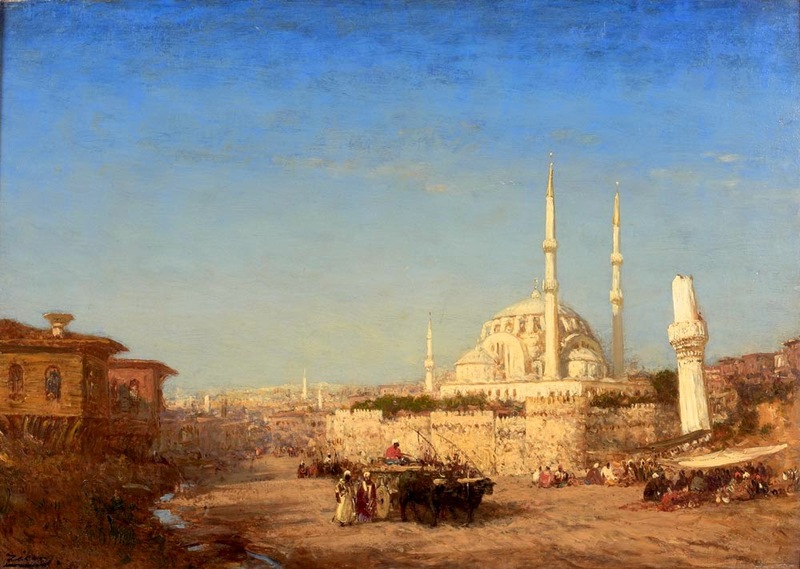 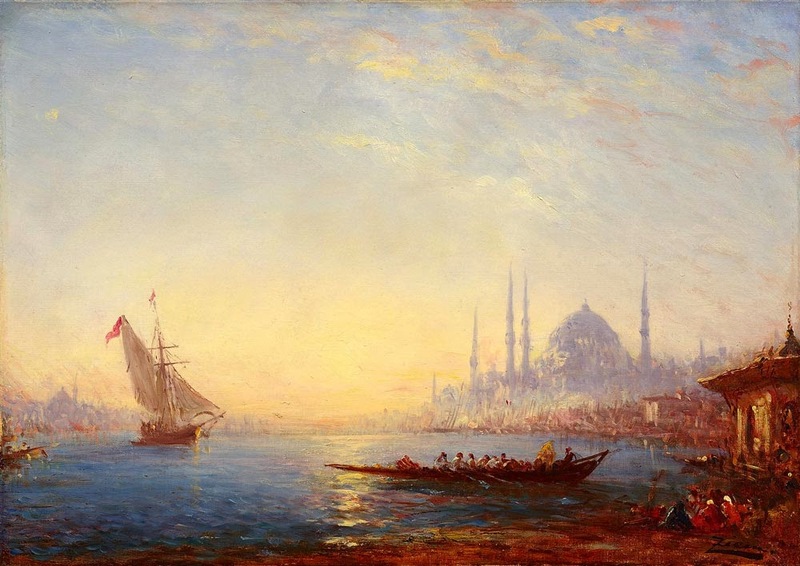 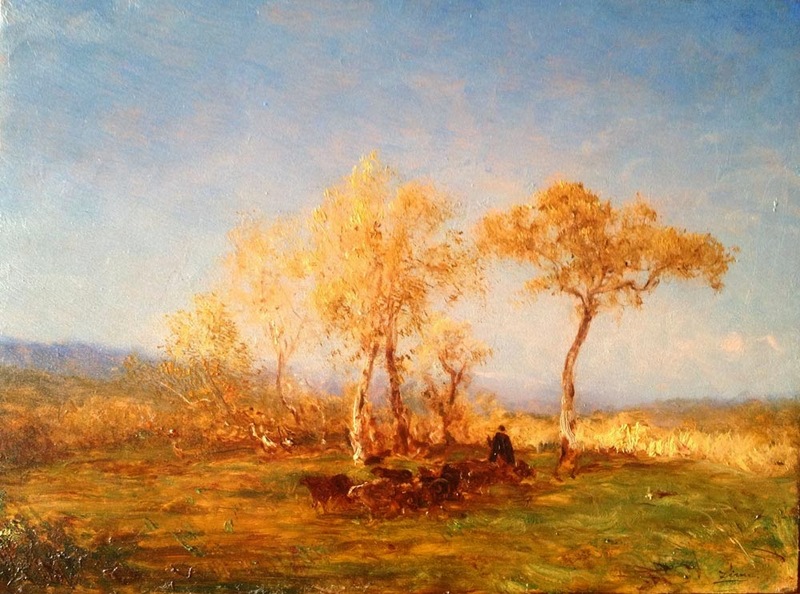 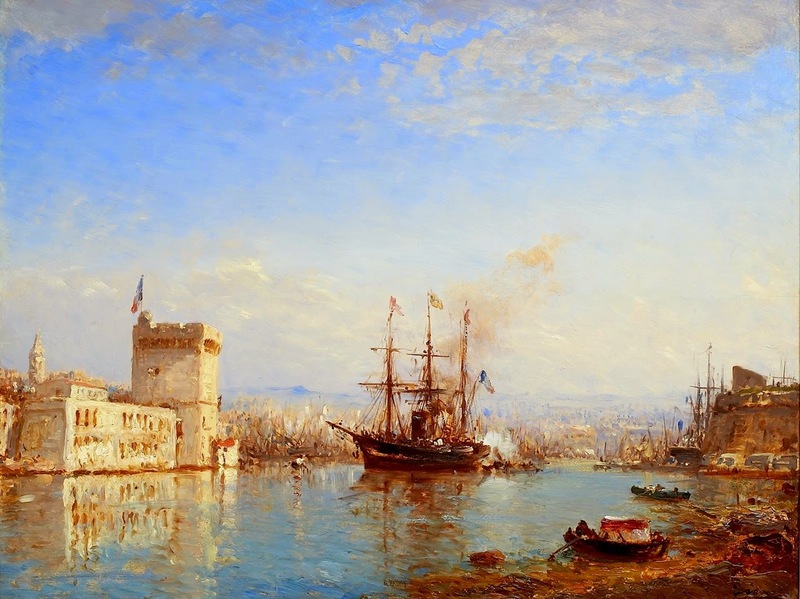 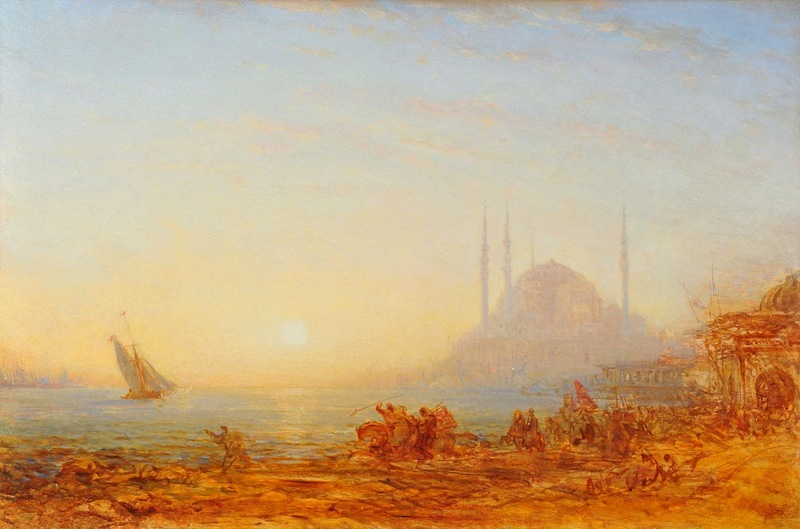 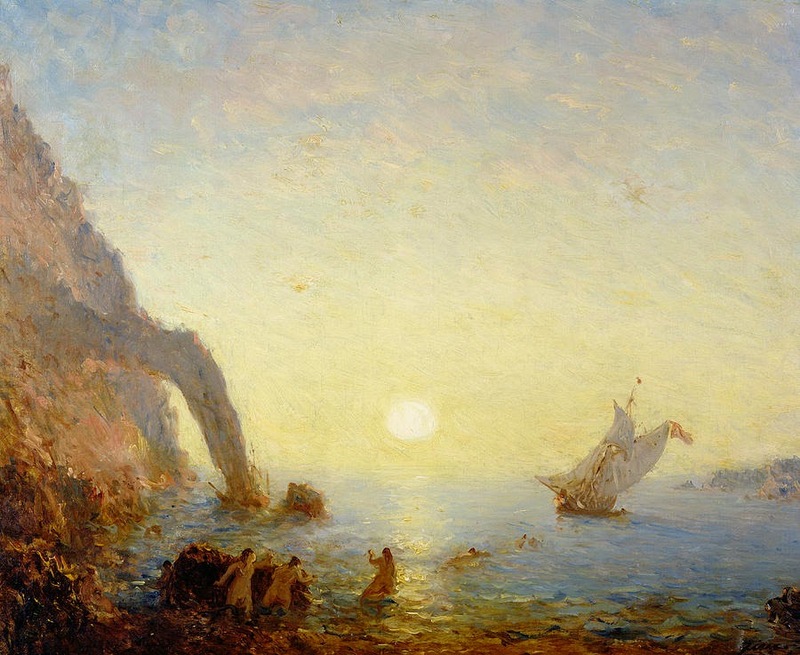 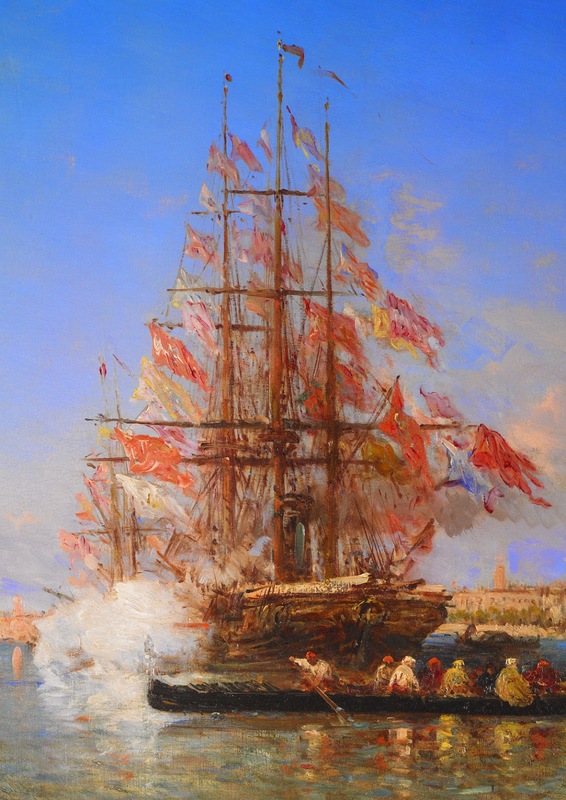 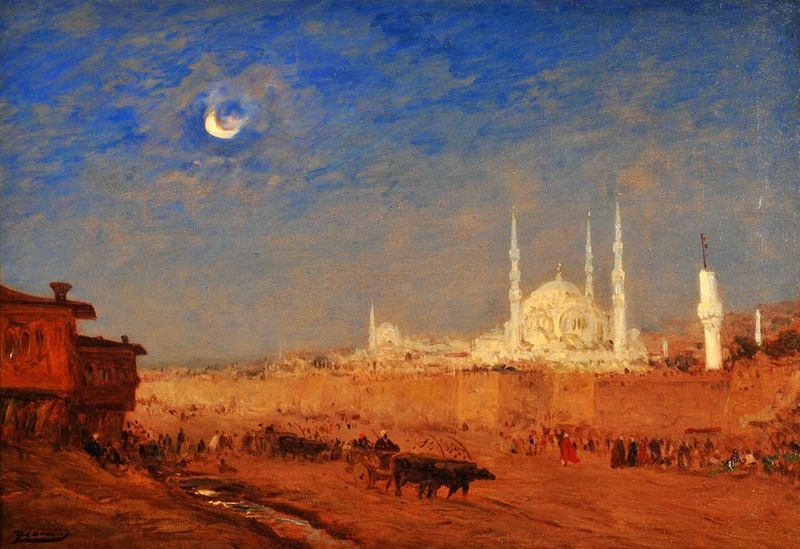 In 1839 he moved to Marseilles, where he received some informal instruction in painting from Adolphe Monticelli. 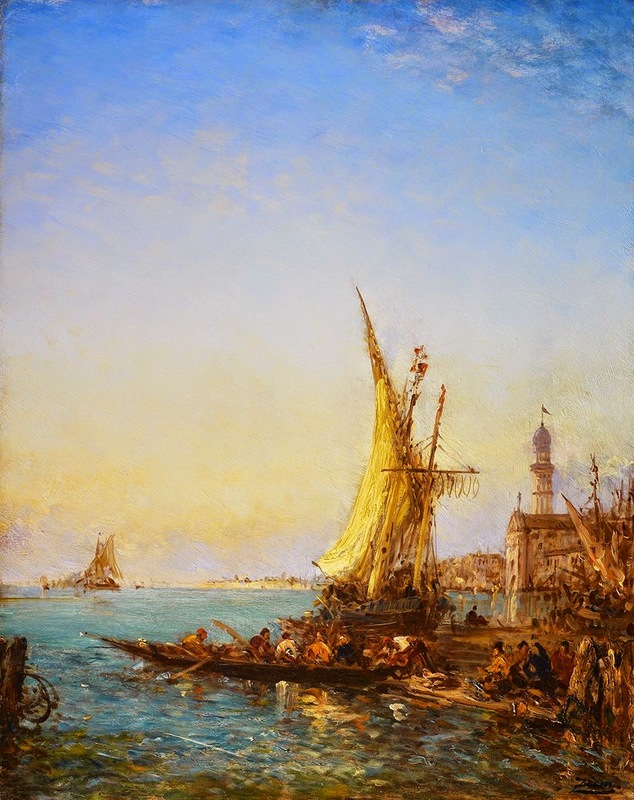 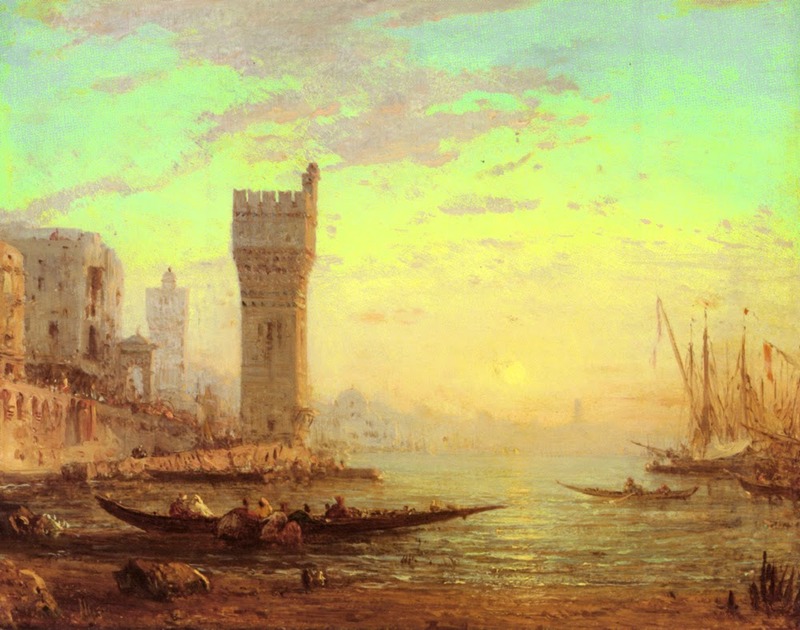 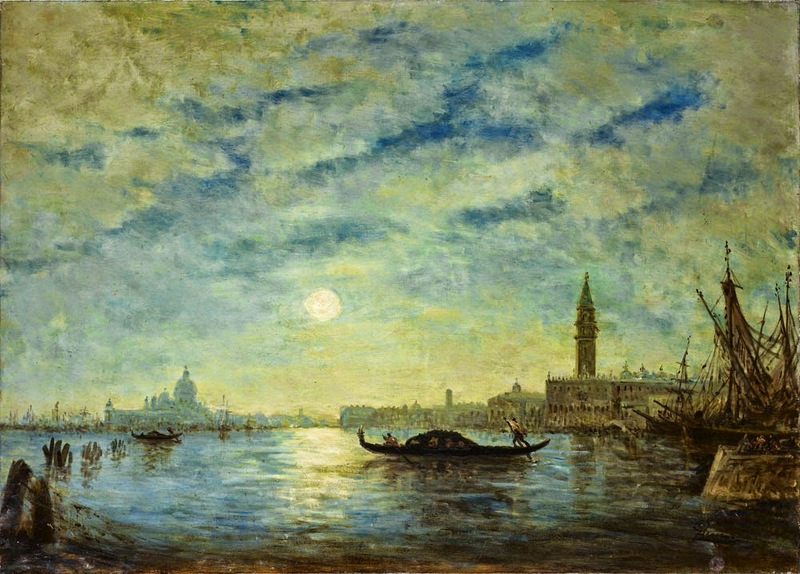 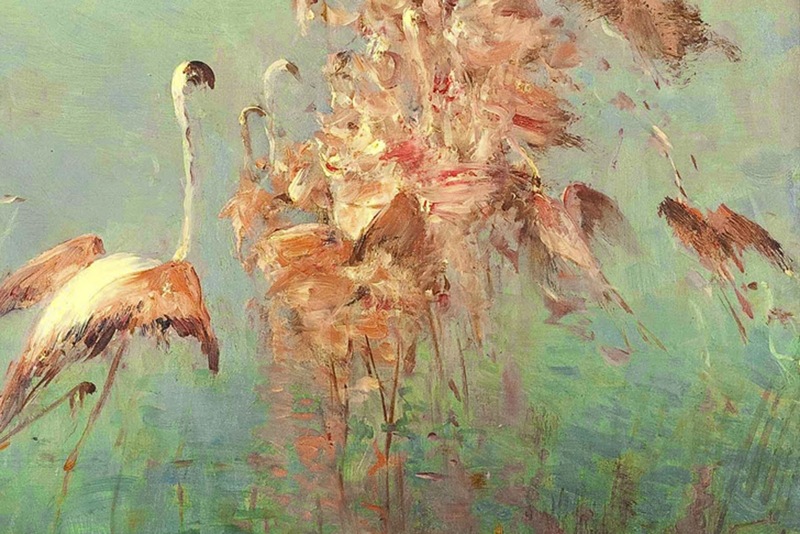 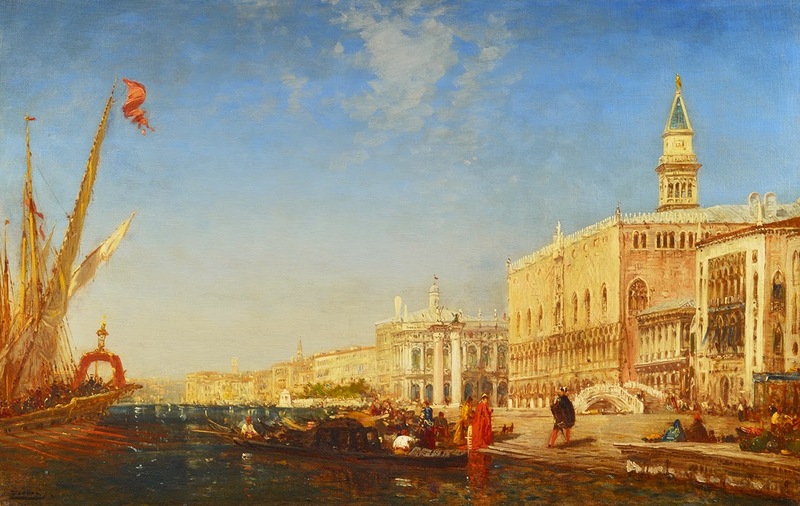 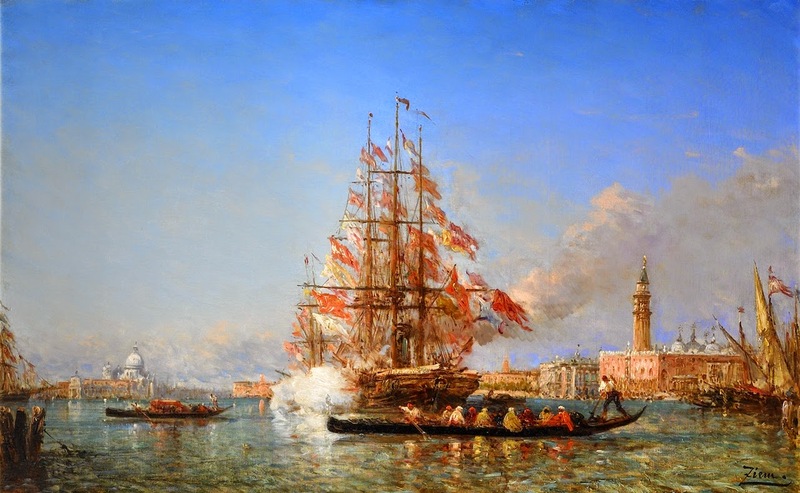 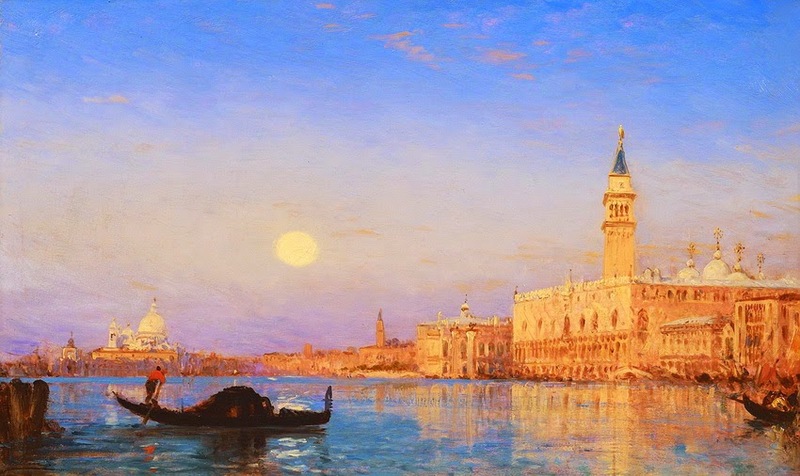 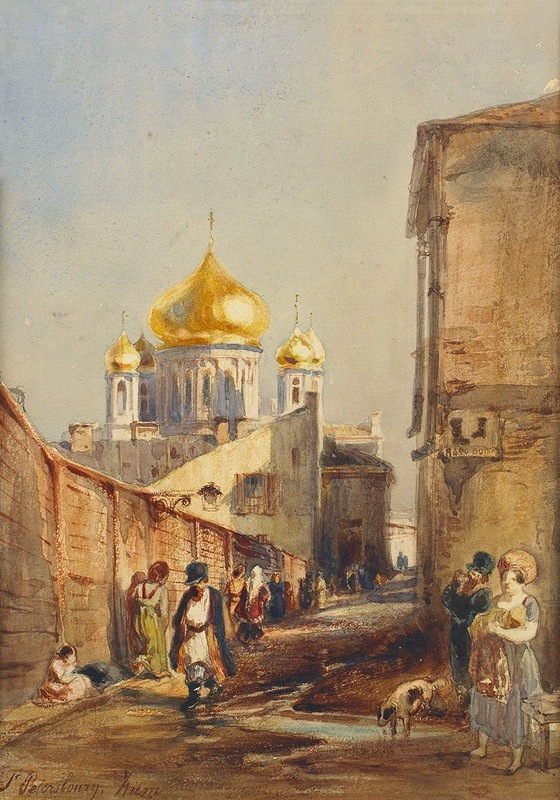 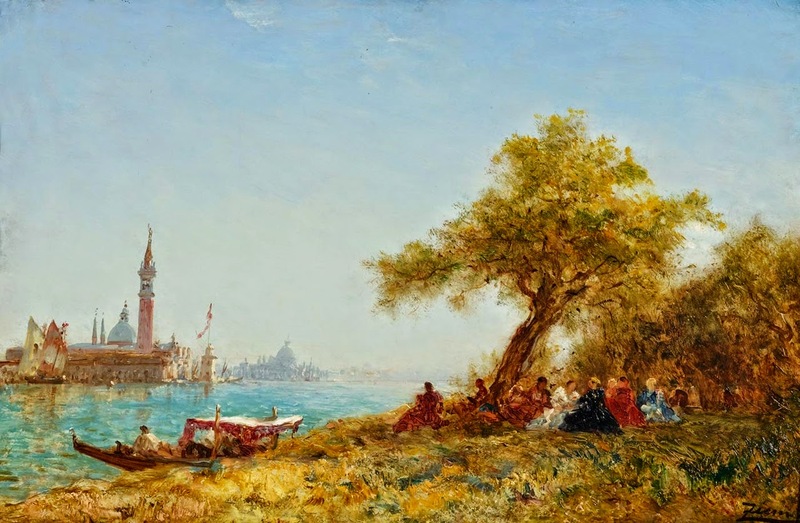 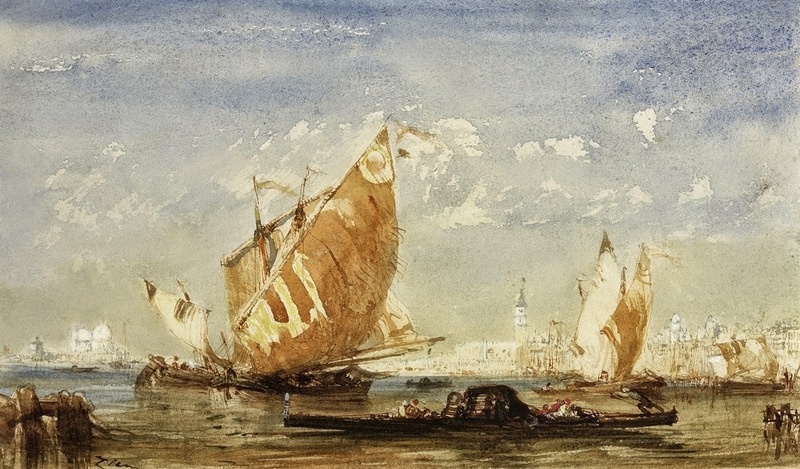 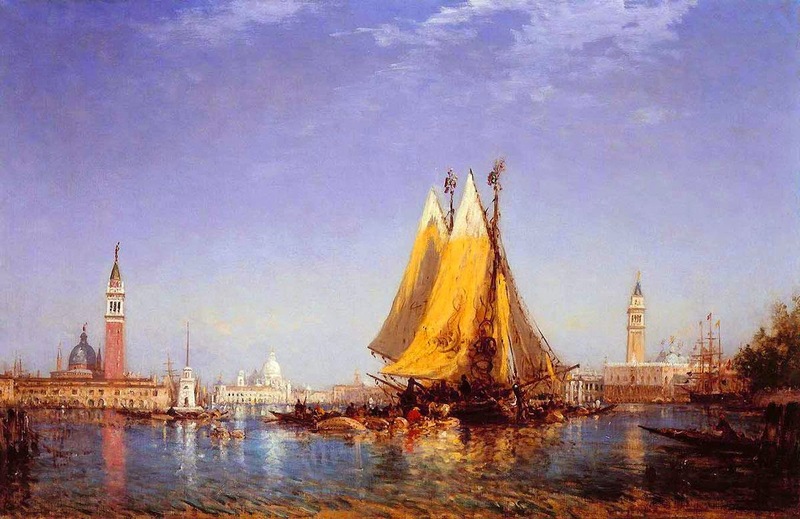 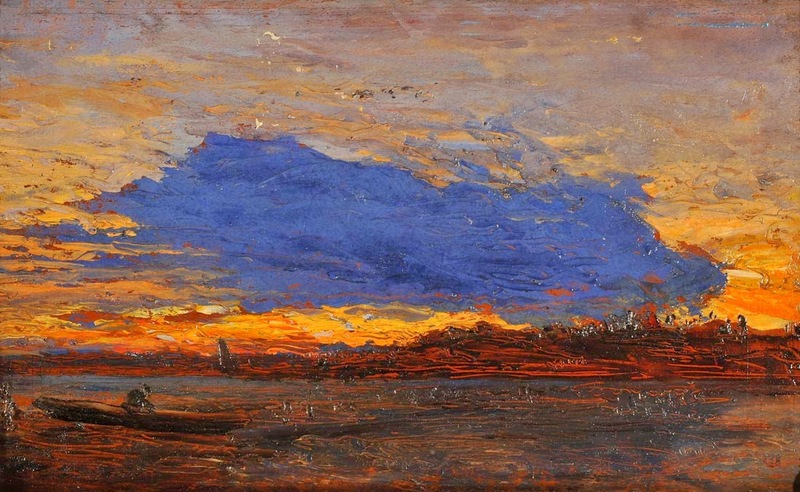 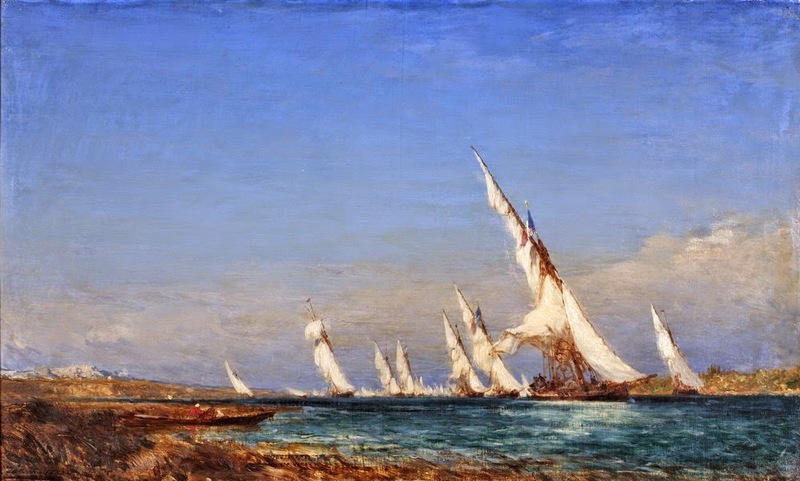 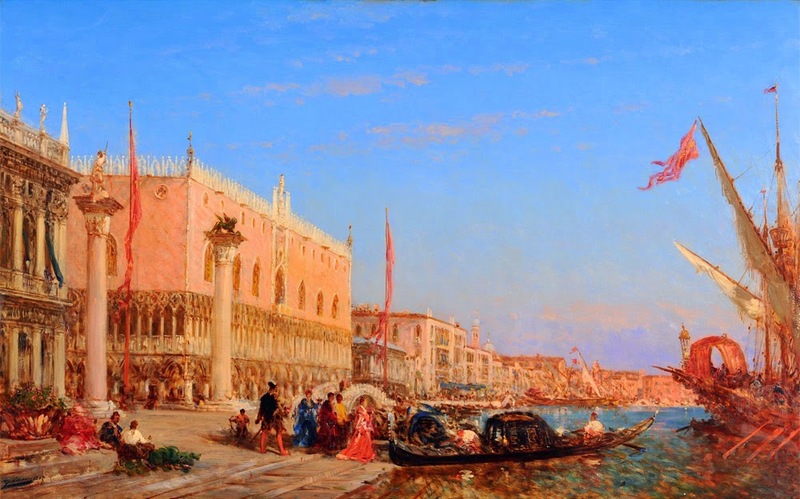 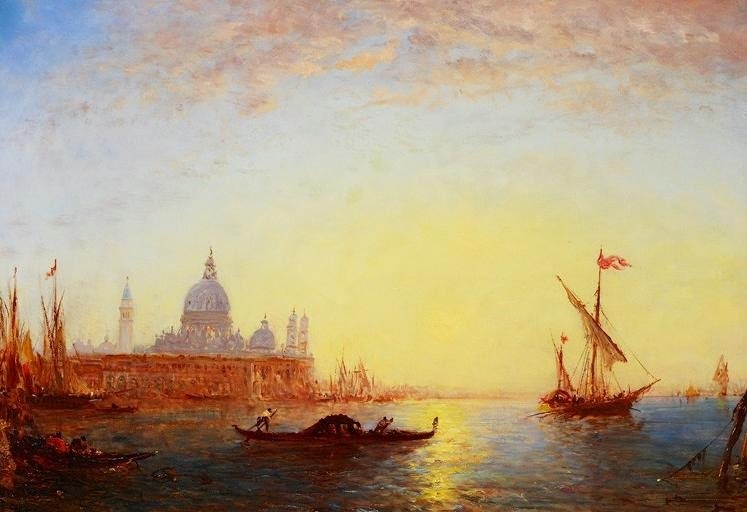 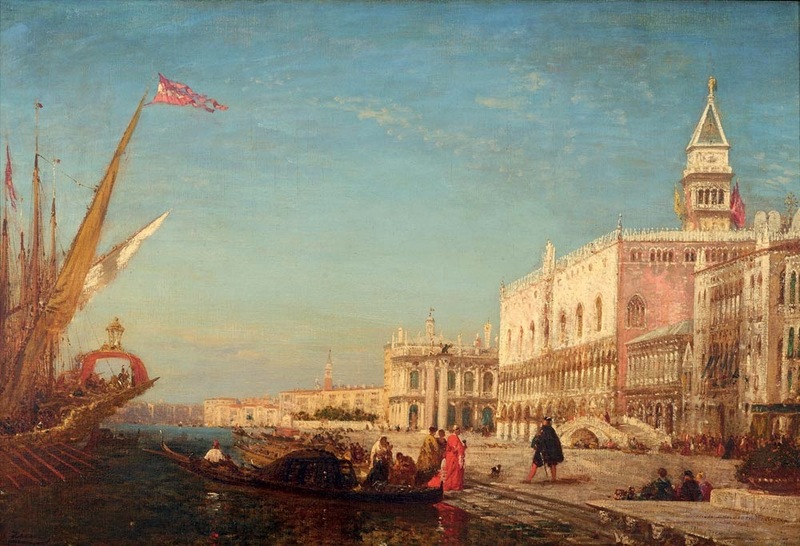 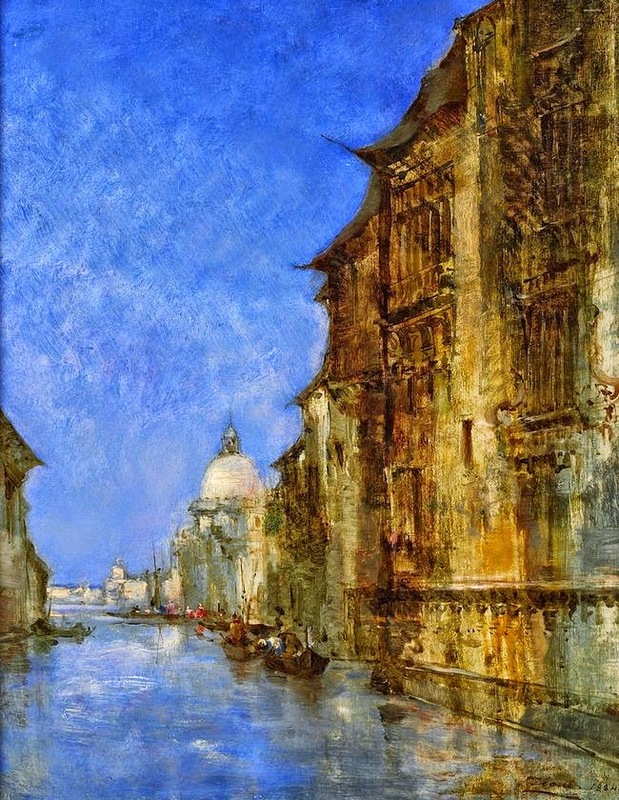 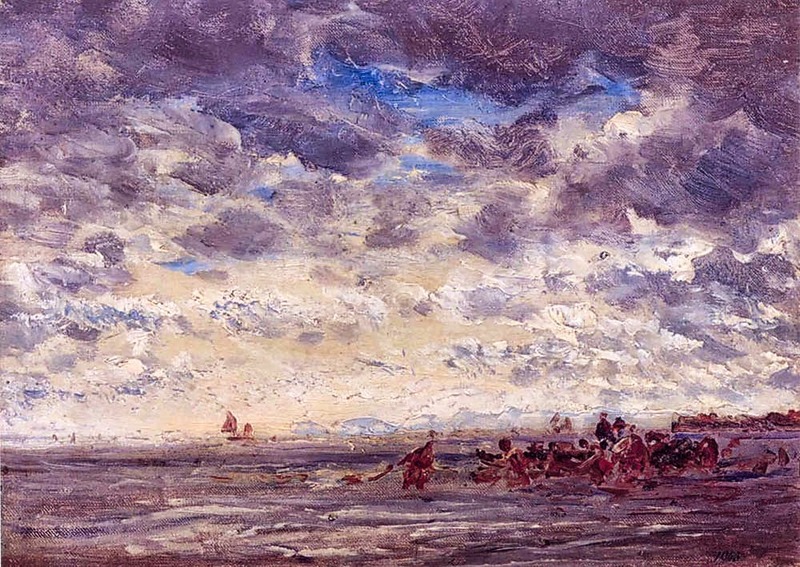 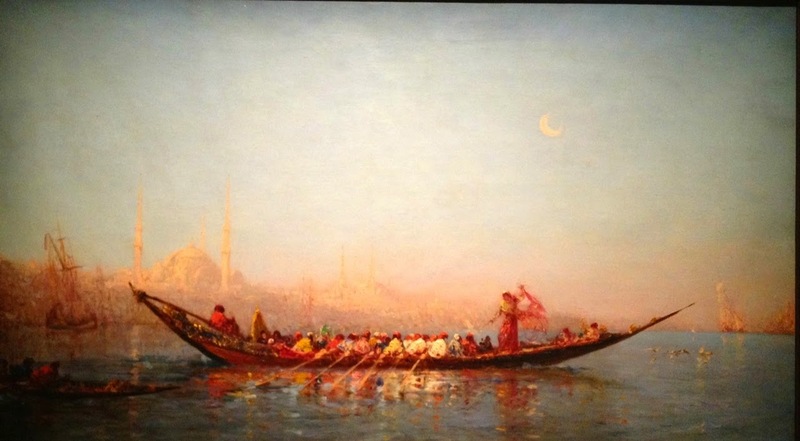 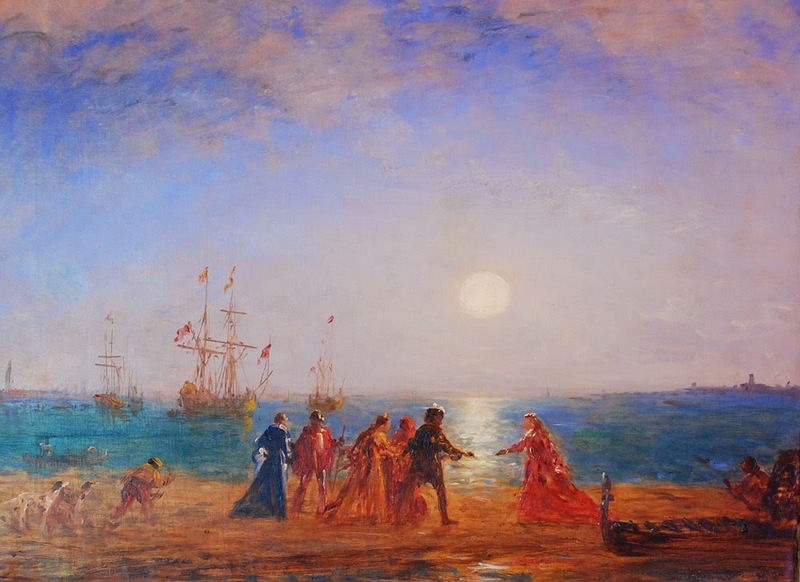 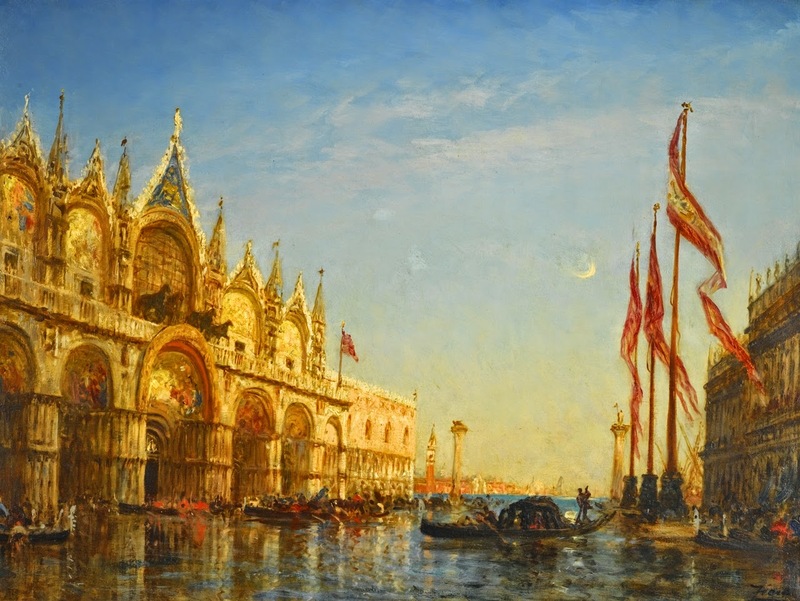 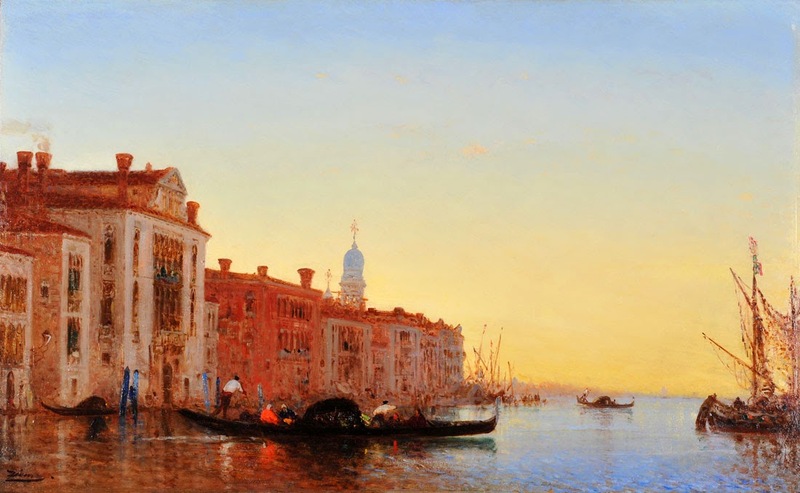 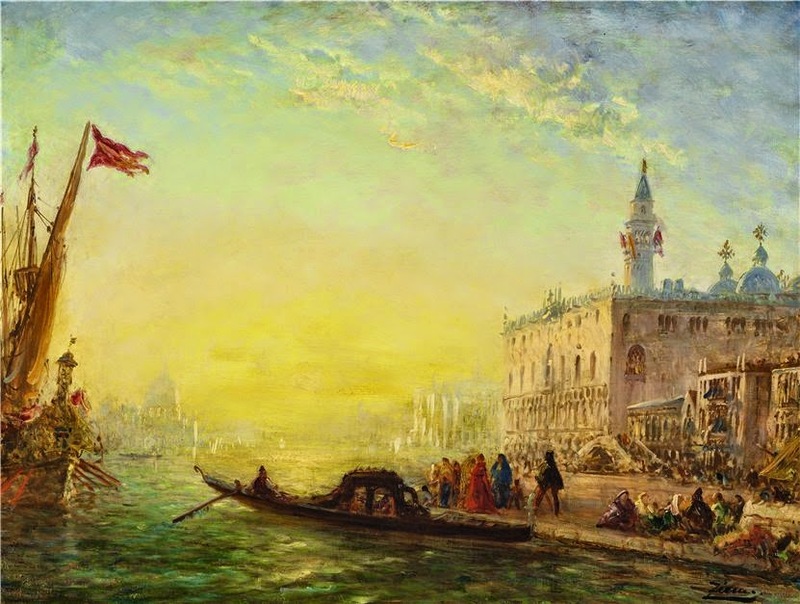 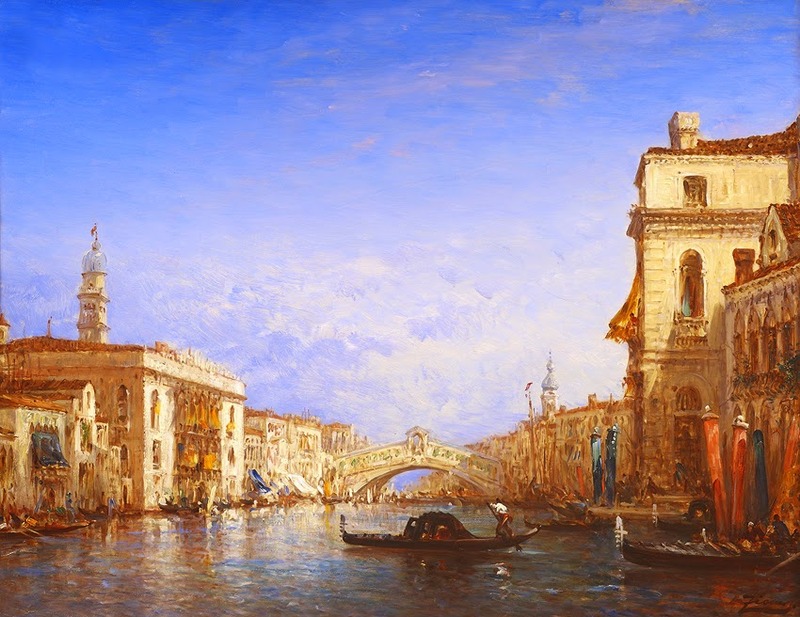 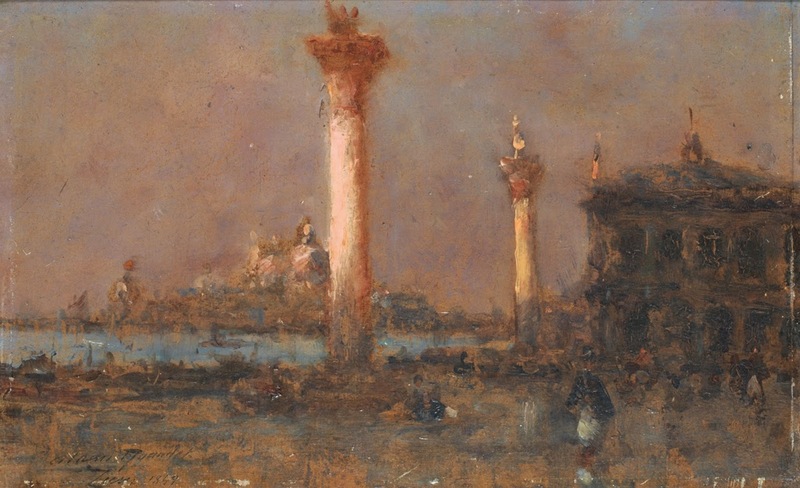 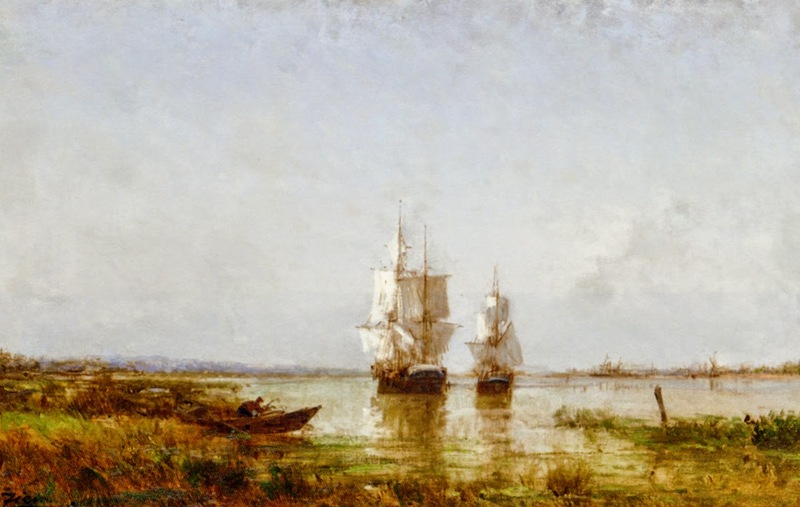 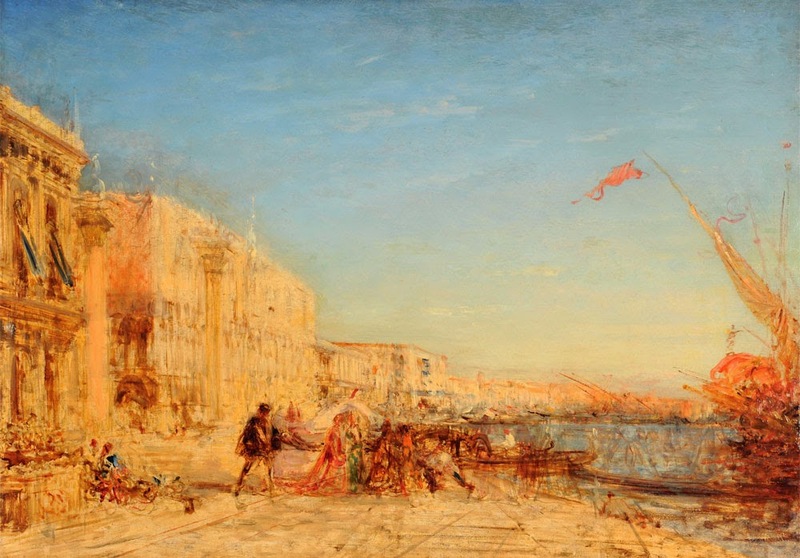 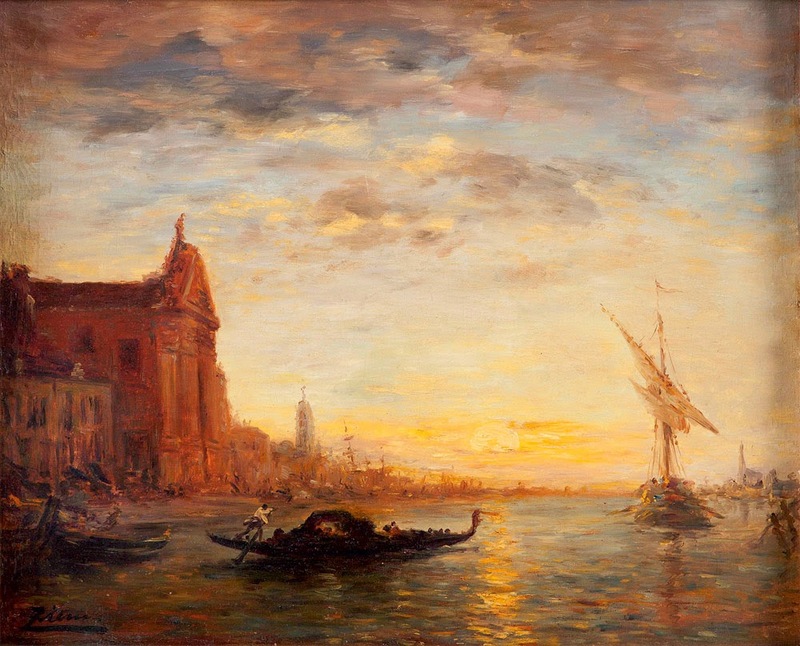 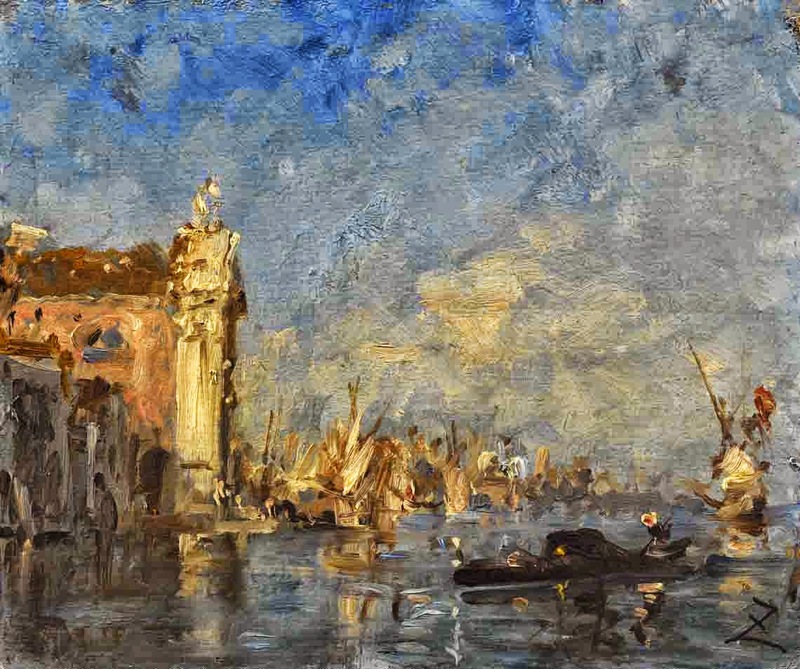 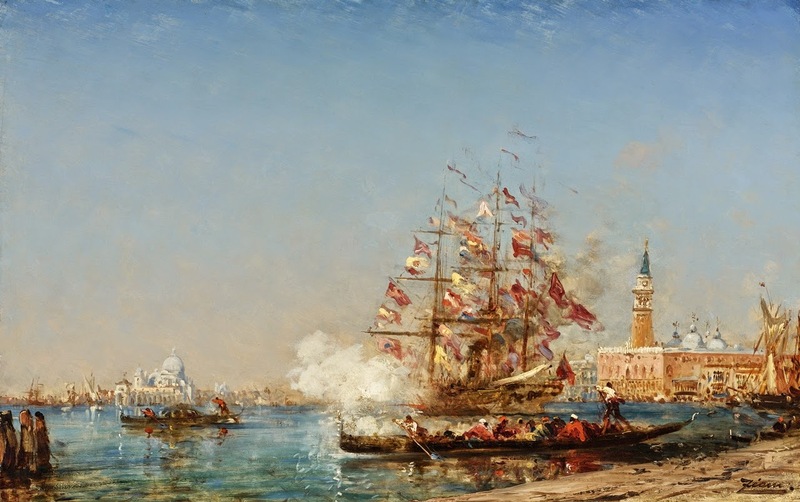 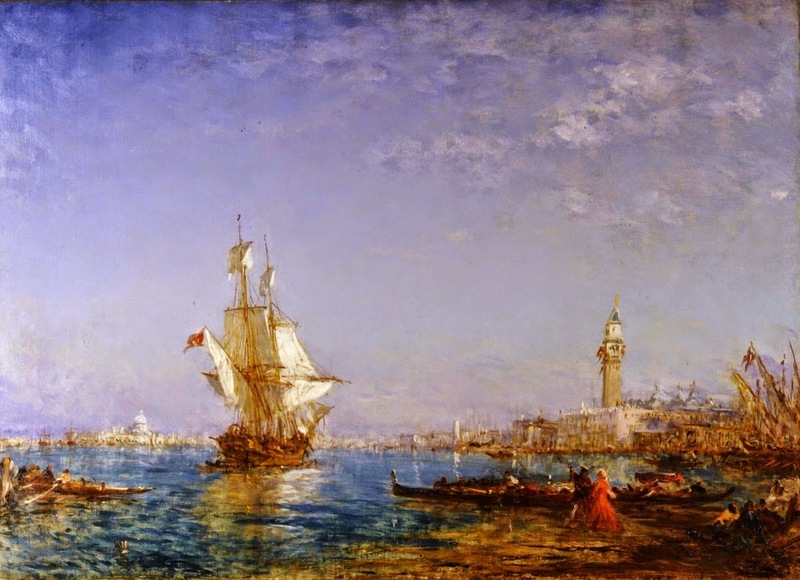 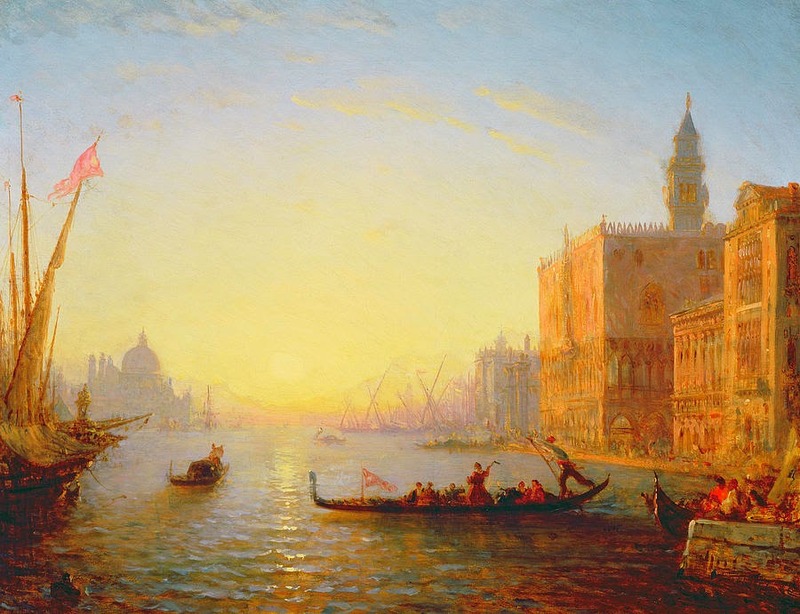 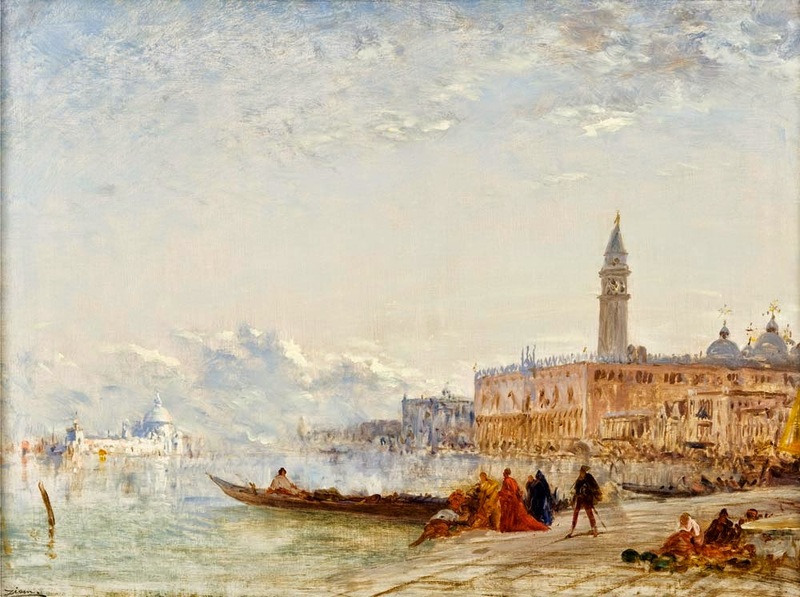 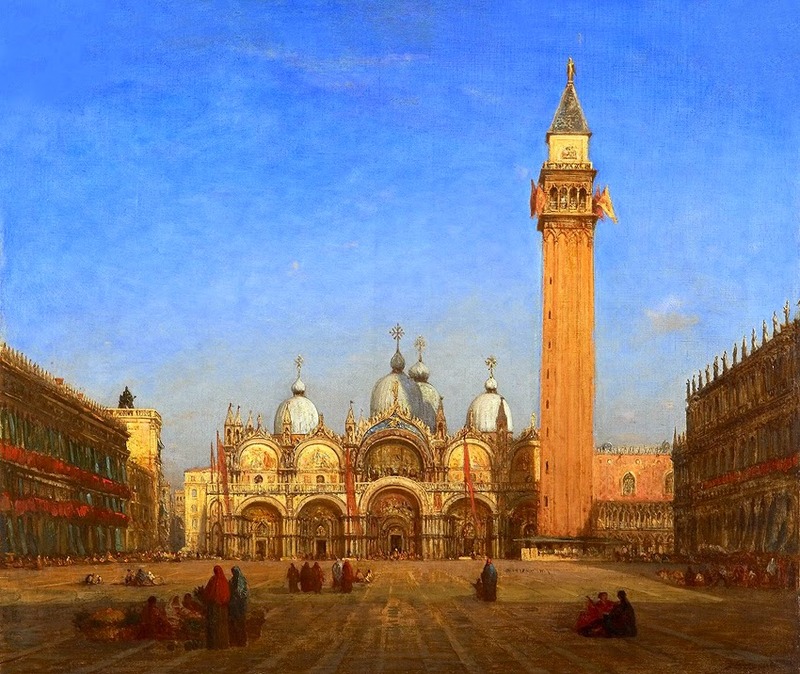 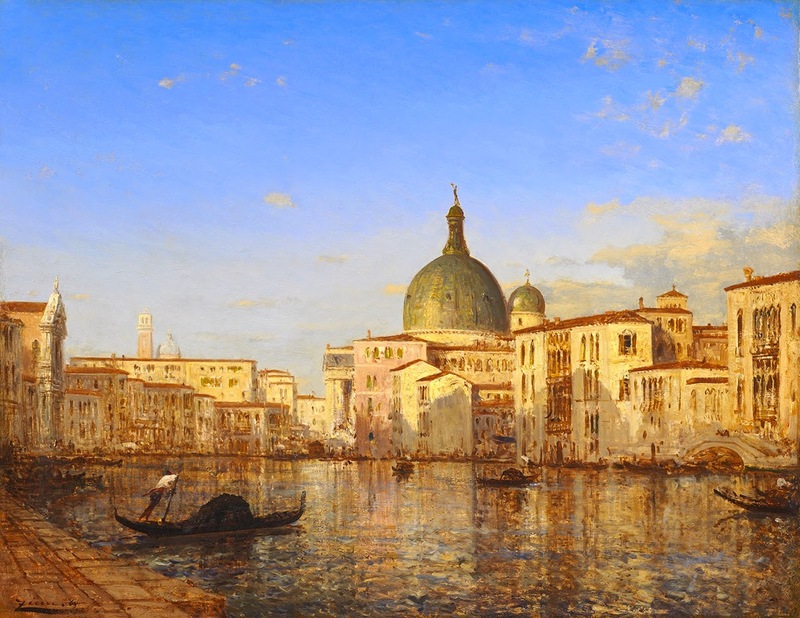 Painting developed from a hobby to a career following an 1841 visit to Italy where he fell in love with the city of Venice, a place that would become the source for many of his works, and to which he returned annually until 1892. 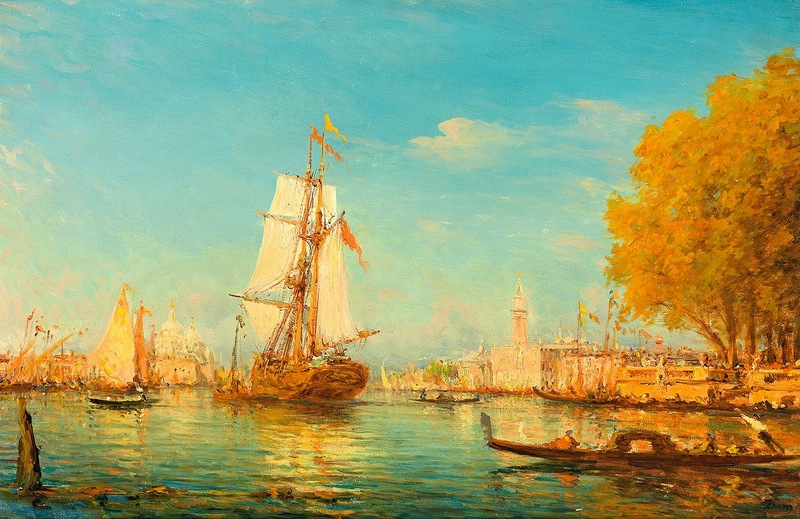 Apart from Venetian scenes, he also painted many still lifes, portraits, and landscapes from a variety of places including Constantinople, Martigues, Cagnes-sur-Mer and his native Burgundy. 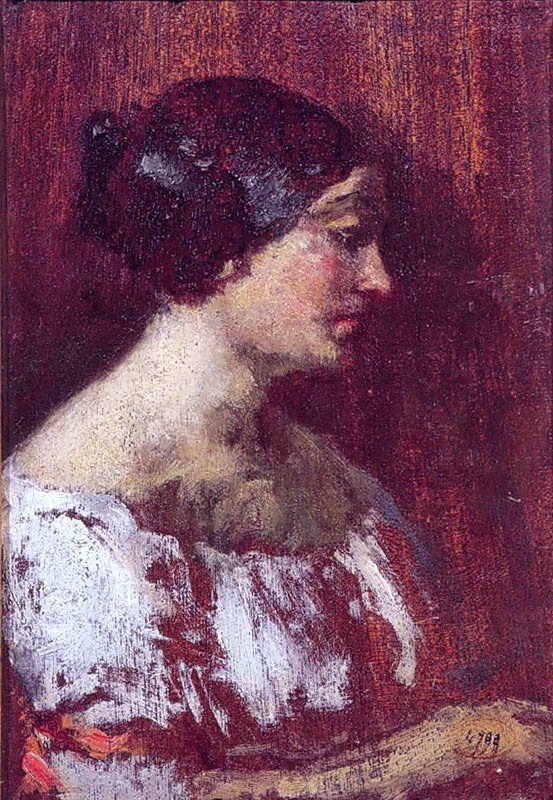 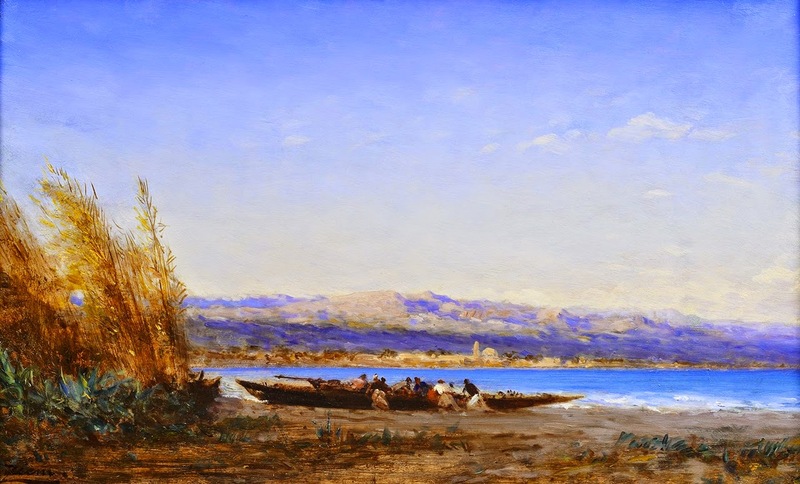 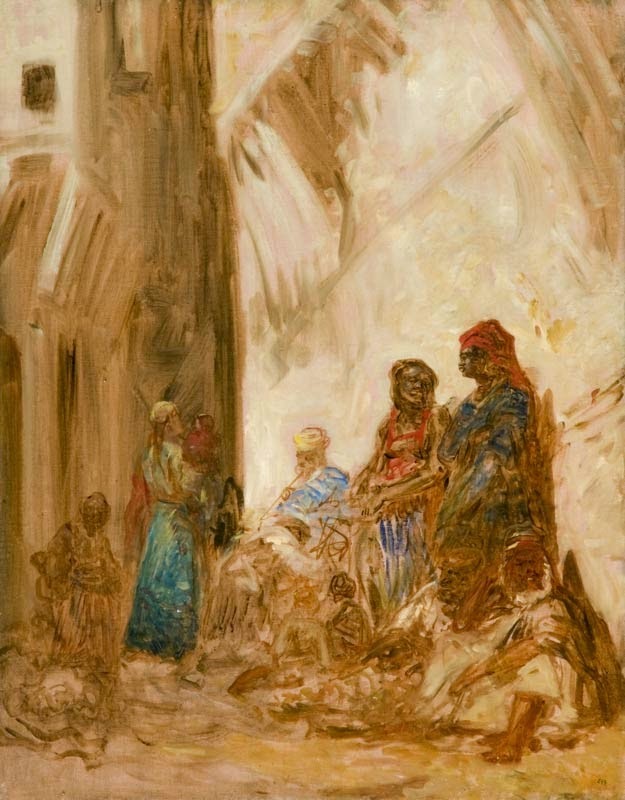 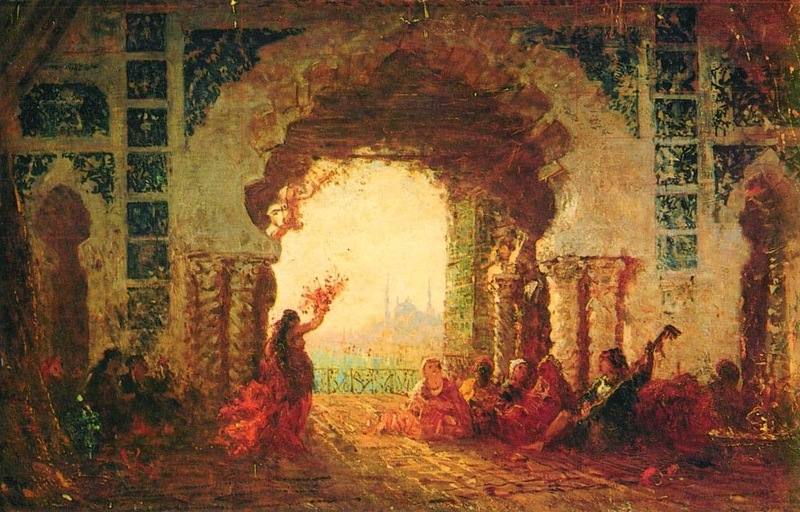 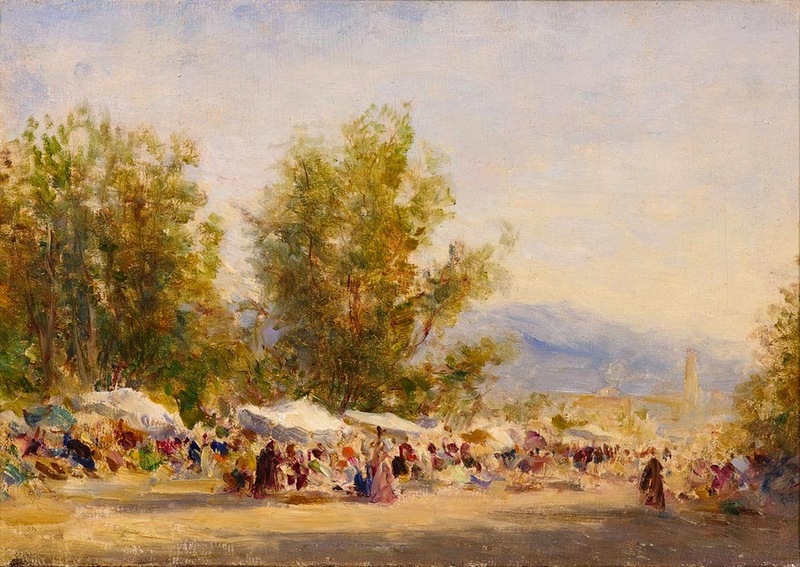 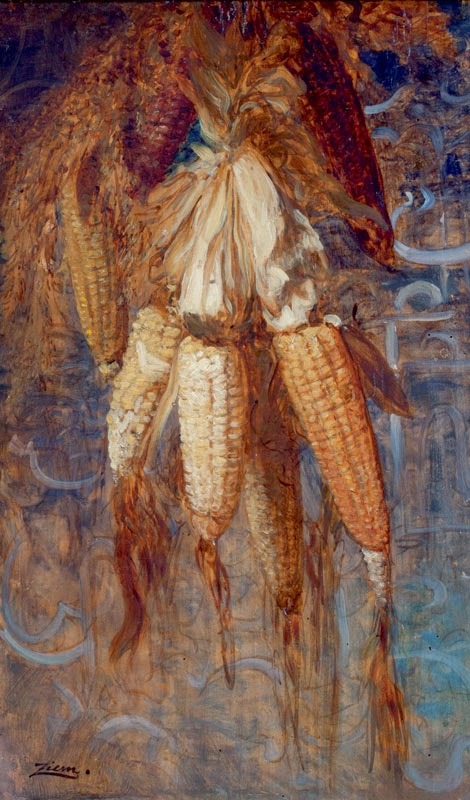 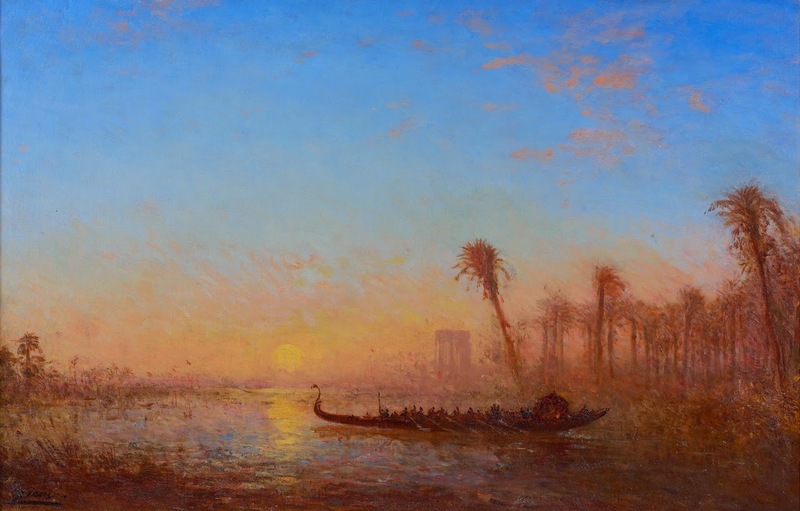 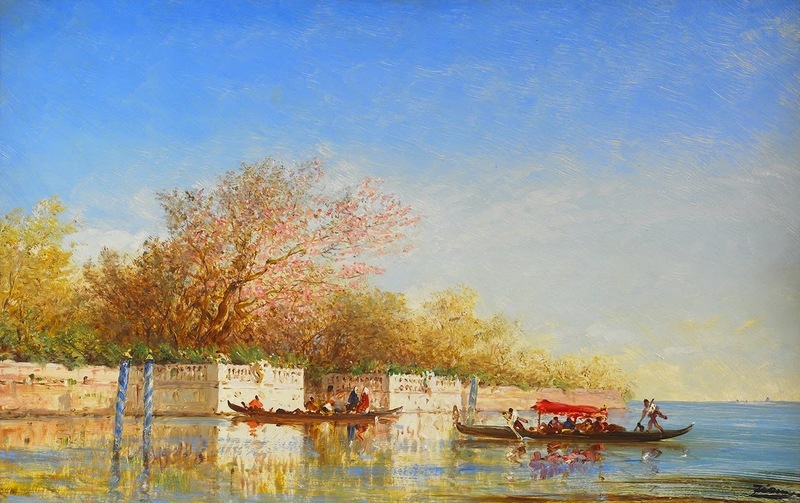 Ziem's works were first exhibited in 1849 at the Paris Salon, and Ziem remained a regular exhibitor there for many years. 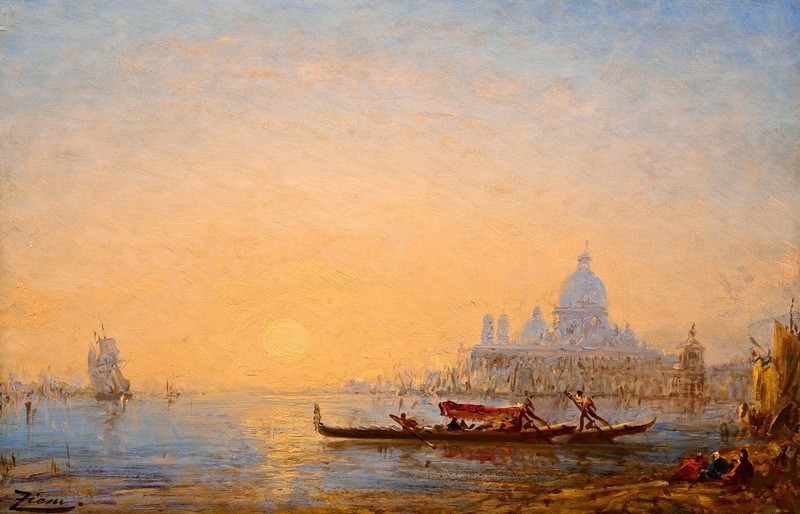 He also traveled extensively throughout Europe and in 1860 moved to Montmartre, the artistic quarter of the city of Paris. 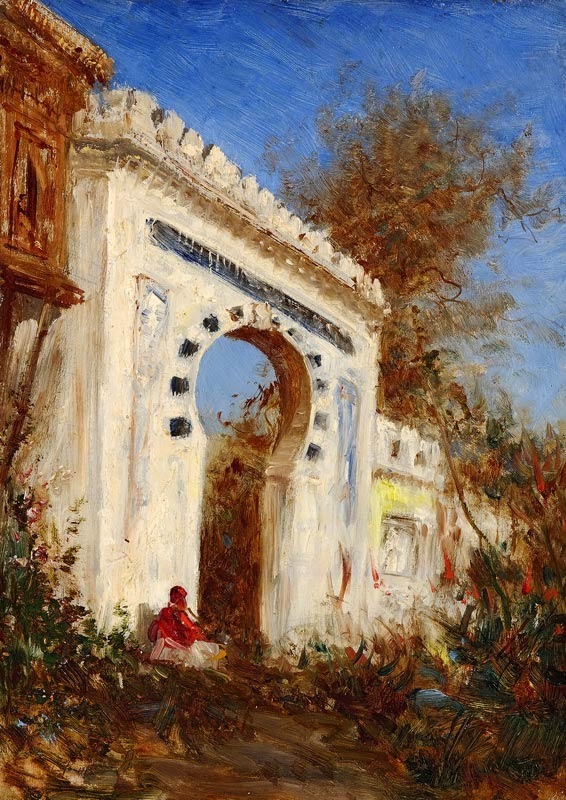 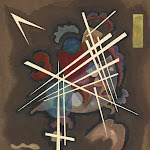 Financially successful, he was known to assist struggling young artists. 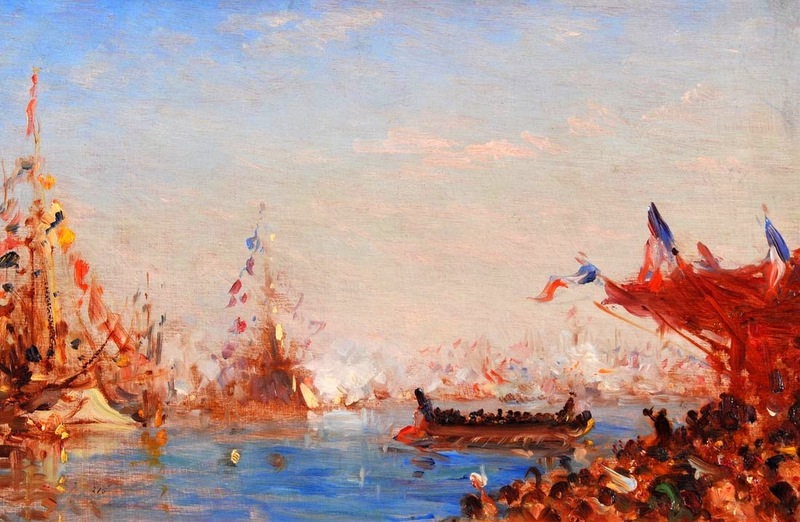 In 1857, the government of France recognized his contribution to the art world by making him a Chevalier of the Legion of Honor. 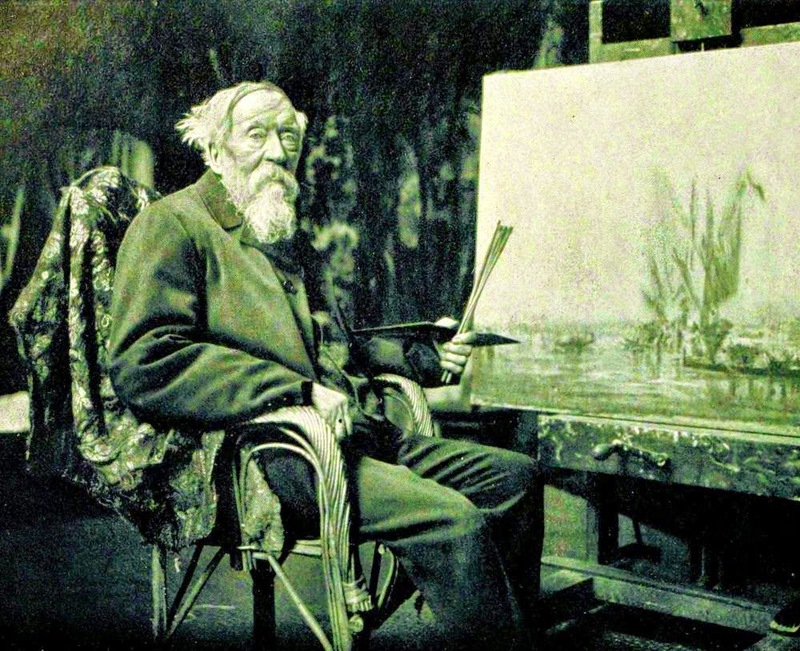 Félix Ziem died in 1911 and was interred in the Père Lachaise Cemetery in Paris. 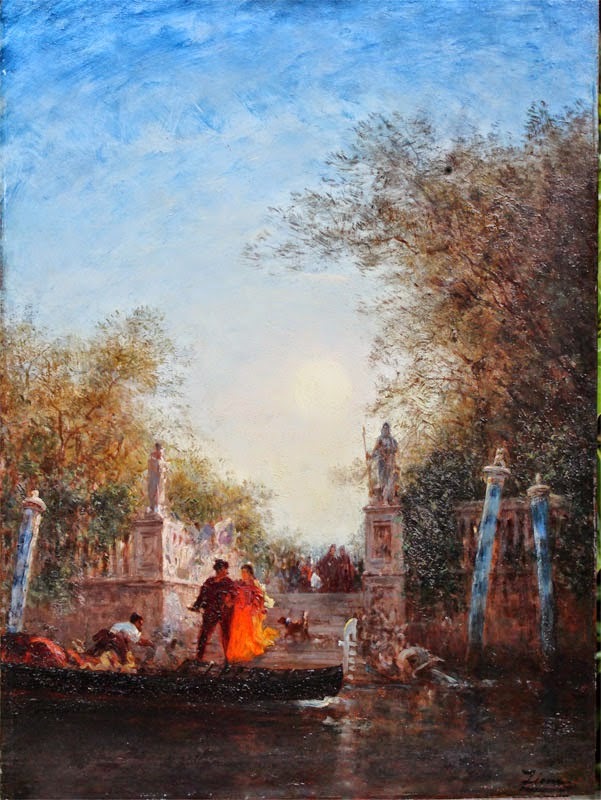 Félix Ziem (1821-1911) è stato un pittore Francese🎨 nello stile della Scuola paesaggista di Barbizon. 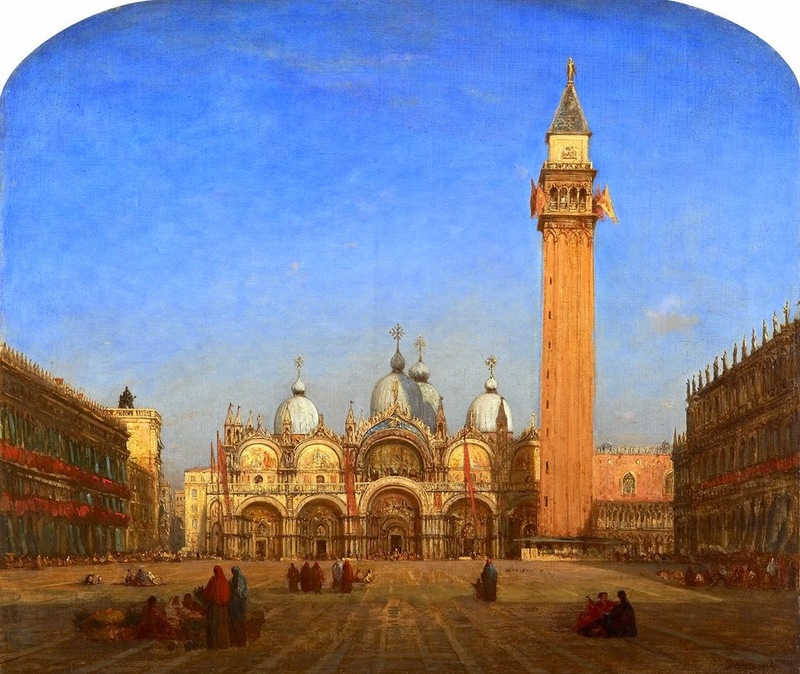 Nato nella regione della Borgogna di Francia, originariamente Ziem progettava di diventare un architetto e studiò presso la Scuola di Architettura di Digione e per qualche tempo si dedicò a questa professione. 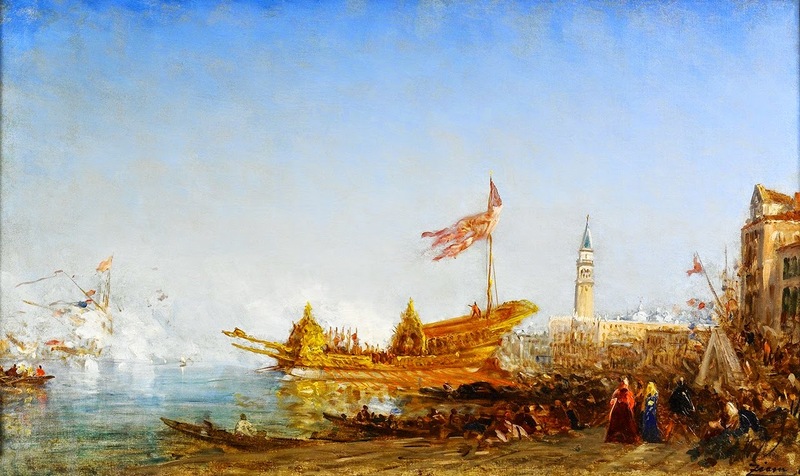 Nel 1841, fece diventare la pittura la sua attività, in seguito ad una visita in Italia dove venne molto colpito dalla città di Venezia, un luogo che sarebbe diventato la fonte di ispirazione di molte delle sue opere. 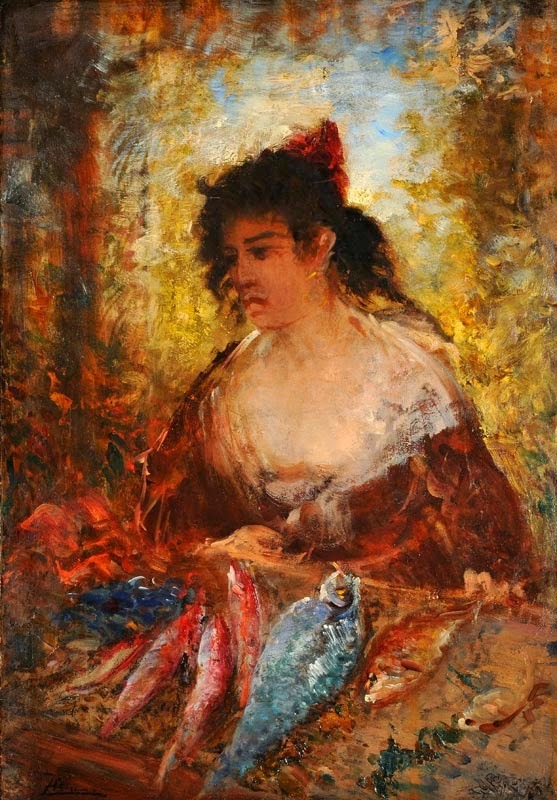 Oltre alla paesaggistica che ritraeva la "sua" Venezia, dipinse anche molte nature morte, ritratti e paesaggi di vari luoghi, tra cui Costantinopoli, Martigues, Cagnes-sur-Mer e la sua nativa Borgogna. 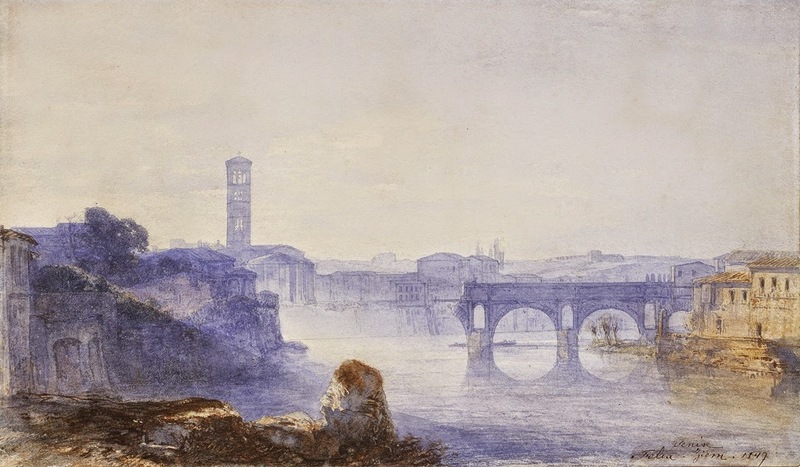 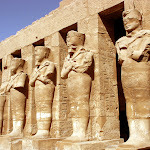 Le opere di Ziem furono esposte al Salon di Parigi a partire dal 1849. 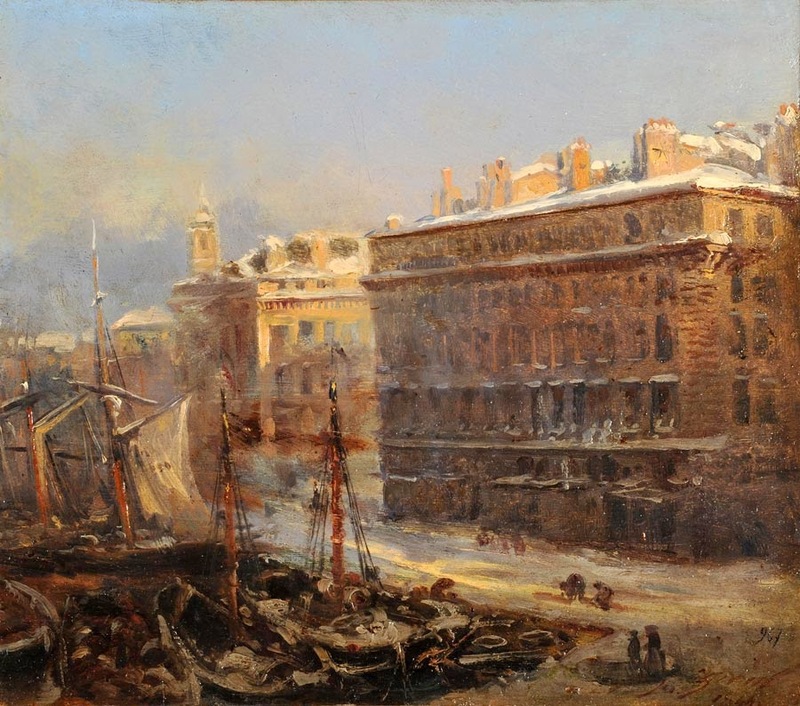 Nel 1860 si trasferisce a Montmartre, il quartiere artistico della città di Parigi. 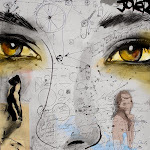 Di ampie disponibilità economiche, aiutò spesso giovani artisti. 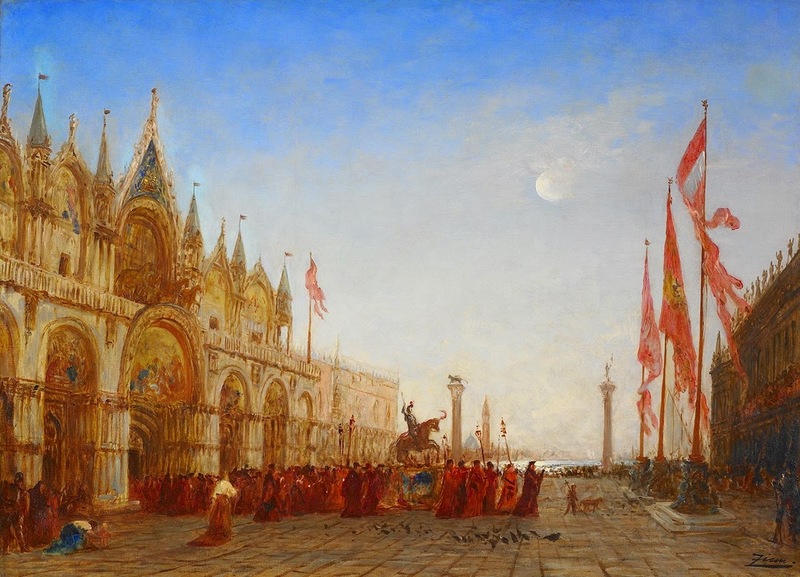 Nel 1857, il governo francese ha riconosciuto il suo contributo al mondo dell'arte, facendo di lui un Cavaliere della Legion d'Onore. 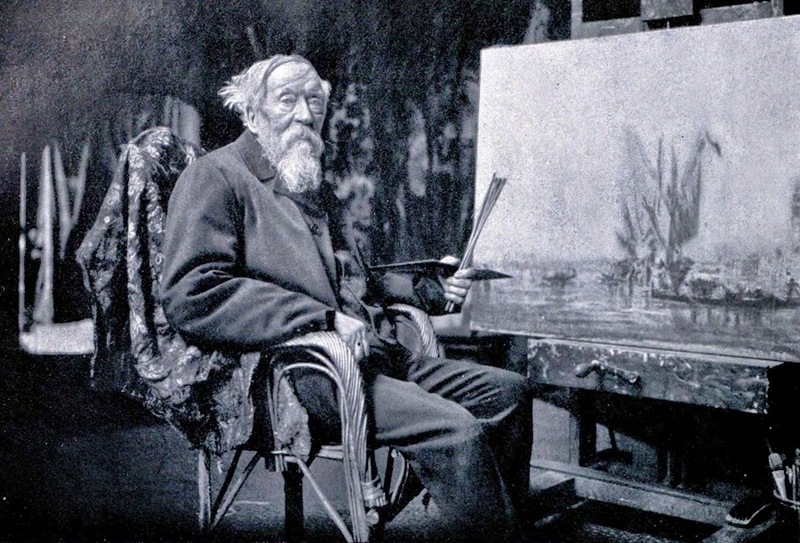 Félix Ziem morì nel 1911 e fu sepolto nel cimitero di Père Lachaise a Parigi, la sua statua tombale è opera dello scultore francese Victor Ségoffin.